We are very pleased to present an extraordinary exhibition of twentieth century drawings from 1913-1983 at Frieze Masters. The human form has served as inspiration for artistic work since the earliest drawings, and our show is dedicated in particular to the curves and shapes of women. A special highlight is the release of 40 early drawings by renowned German artist George Grosz (1893-1959). These drawings were made at the beginning of the artist’s career in 1913 and rediscovered in his estate 100 years later. Most of them have not been previously exhibited. His sparse drawing style is minimalistic and expressive – not a single line is wasted. 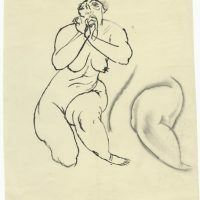 Grosz’s figures appear to be transparent and yet are full of character and movement. These exceptional works are being shown alongside drawings by Andy Warhol, whose controversial “Nosepicker” Grosz famously defended while Warhol was a student in Pittsburgh. 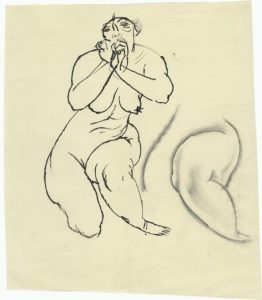 The artists’ early works display a similar use of line which can be fully appreciated when viewed together. Other highlights of our show include a number of A. R. Penck’s 1960s stylised pencil drawings on paper, which have never before been seen by the public, alongside a selection of remarkable drawings from the 1970s by Georg Baselitz and Anselm Kiefer, among others.